Jump into action with the Jump Power 12ft Trampoline and Enclosure! Kids are sure to have endless fun on this sturdy trampoline—they may even develop their coordination and get some exercise in. The Jump Power 12ft Trampoline and Enclosure has wide legs to keep the frame stable no matter how much your kids bounce. Designed for safety and durability, this high quality trampoline has a weldless frame with patented JP joints, providing the strength needed to withstand energetic play. To maximise safety, the enclosure net of the Jump Power 12ft Trampoline is sewn into the mat, preventing the user from coming into contact with the springs and main frame. The enclosure poles curve away from the net, so kids can avoid bouncing into them, minimising the risk of accident or injury. 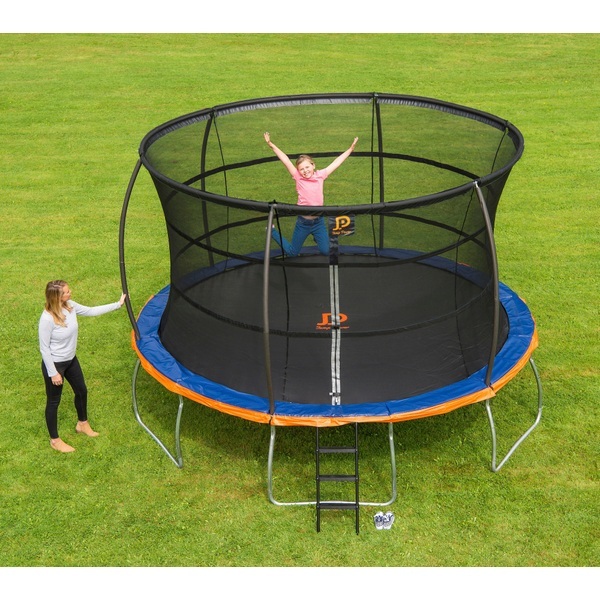 The Jump Power 12ft Trampoline and Enclosure has a steel top ring to retain the rigid shape of the weather proof netting. The enclosure’s reinforced webbing helps to prevent rips or tears, while the high qualit jump mat is UV resistant to guard the jumping surface from wear under UV rays. A zinc coating protects the springs against rust, helping them to retain maximum elasticity for a consistent bounce experience. Everything about the Jump Power 12ft Trampoline and Enclosure is engineered to last outdoors, bringing fun to your garden for years to come. Trampoline should be assembled on grass. EU Warning: Not suitable for children under the age of 3 years due to small parts which could cause a choking hazard. Avoid contact with the enclosure poles or springs for added safety.